Sunny Scoops is a video slot game powered by the famous Thunderkick software company. 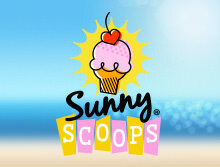 Sunny Scoops comes with a setup of 3 reels along with 14 paylines which are fixed. The premise of this game is inspired by a cutesy ice-cream truck. Hence, this game has different colored ice-cream scoops. 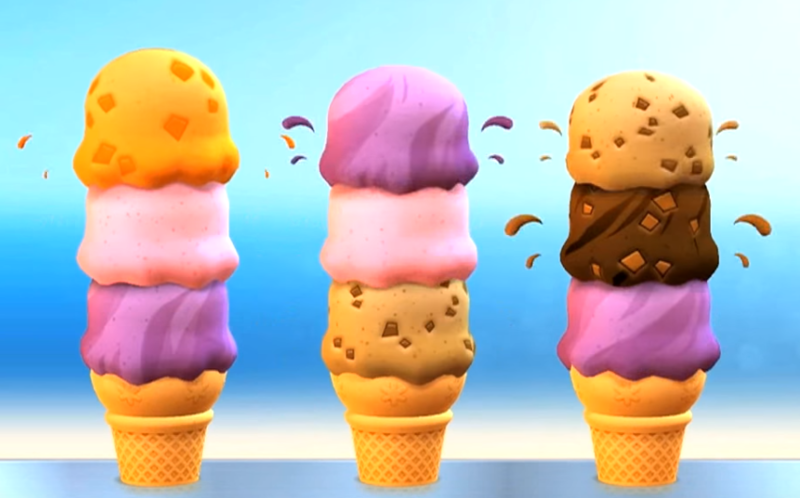 Instead of having a classic and conventional slot reel, Thunderkick created a reel where the symbols or icons are dropped on the ice-cream cones. The entire set-up is very alluring with a blue sky in the backdrop. Thunderkick, as a company has started coming with new and refreshing themes. Sunny Scoops definitely fits the bill for newly curated themes which will give players a sense of newness in their indulgence in some gambling action. Sunny Scoops, with its rejuvenating theme, is already making waves in the gambling community. Thunderkick has outdone itself with this new and adorable theme which is so light-hearted that even if you lose your bucks, you won’t mind much. Minimum coin(s) that can be wagered per line is 1. While the minimum coin size for every line 0.1 and the maximum coin size extends to 100 per line. Sunny Scoops also features a jackpot which offers 5x more than the stake. The Return to Player for Sunny Scoops stands at 96%. The rate is definitely not the highest in the market but is still much better than many video slots seen in recent times. Sunny Scoops can be seen as a classic slot with its 3 reels along with 14 fixed pay lines adorned against a background of vibrant colors and a gleaming blue sky. The game has a very warm and vibrant vibe to it. This feel-good game has all of its elements inspired from a sunny day in California. Now coming on the symbols of this game, it mustn’t be too hard for you to guess that Sunny Scoops has ice-cream scoops as its symbols. It features a variety of flavored scoops. It includes Blueberry Bite, Chocolate Explosion, Orange Sunset Golden Honey, Strawberry Dream, Sweet Pear-faction, and Coffee Crush. The game, unfortunately, doesn’t entertain any wild symbols and all the symbols have a similar prize value. The reel is quite fun looking but there are some aspects that are found missing which these days are more than common in video slots. The game is complemented with a tune which is quite jaunty and congruent to the theme. The whole experience is quite fun. The game definitely delivers with its peculiar yet interesting backdrop and eccentric soundtrack. However, can the same be said about its bonuses? Read along to find out. Bonus Wheel Game: Sunny Scoops lacks wild and scatters symbols. But it does have a bonus wheel game which acts as a pretty lucrative solution to increase player’s payouts. The Bonus Wheel has a 2-way mechanism. The first tier is triggered when you attain three scoops of the same color/favor on the same reel. Once you are able to activate this step, at the top of that ice-cream tower there will be an appearance of a spinning wheel. Once this wheel has stopped moving, you will be able to land a multiplier from 3x, 2x, 5x to 7x. This is the first step. But if you are lucky enough to land a food symbol upon the spinning wheel, you will move on to the 2nd tier. At the 2nd tier or 2nd stage, you may have a chance of receiving 10 free spins. Free Spins: So, as mentioned above, the 2nd stage leads to the player attaining free spins. For this, you should be on the lookout for a multiplier ladder. This ladder may emerge on your right-hand side. With every free spin, you will move one place ahead in the ladder. With every progression, you will avail an additional spin. And with every non-winning spin, you will degrade to one place on that ladder. For instance, with 4 successive spins, the player will proceed in the ladder and attain a multiplier of 4x. While, if you encounter a non-winning spin then you will be dropped to a place where you can get a multiplier of 3x. At the end of this frenzy, you will start anew at the base game. In case you luck out and land more than a single cluster of free spins, then the entire reward will get accumulated and will be given to you like that. Thunderkick Games is seemed to be upping its casino building skills. With the new Sunny Scoops, you will be sure to be so pleased with the game that you will keep coming back for more. Its RTP is also decently placed at a rate of 97.1%. The soundtrack is quite unusual but pairs perfectly with the quirky theme of ice-creams. We do recommend this game; however, one tip for Thunderkick is that they should work more on their bonuses and add-on features.